Sheila Dillon explores the surprising world of yeast. The tiny organisms, essential to much food production, have become a global commodity and also prized by artisan food-makers. 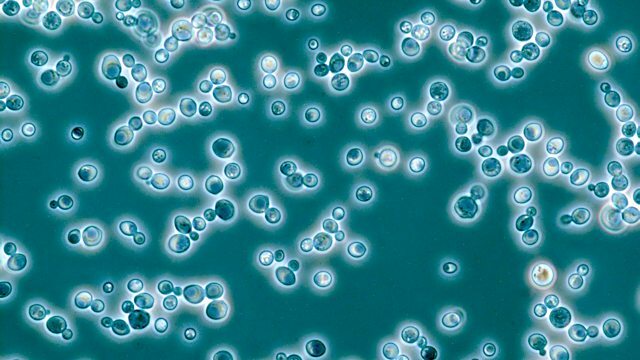 Yeasts, mysterious members of the fungi kingdom, are an essential part of our food production. They play a critical role in baking, brewing, wine-making and much more. Dr Bill Simpson is the Managing Director of a company in Leatherhead that has hundreds of samples of yeasts, old and new, frozen in liquid nitrogen. By preserving different yeasts from around the world his team are able to recreate ales and lagers from the past. Vincent Talleu stumbled upon baking by chance but is now consumed by a passion for good, tasty, healthy bread. Working with a twenty-year-old Swedish yeast 'starter' in an artisan bakery in London, he believes that 'real bread' must be made as it used to be; slowly. This allows the yeast to work its magic. Andrew Whitley is a food educator who started the Village Bakery with a yeast sample he brought back to the UK from Russia. For Andrew, there is absolutely no reason why natural yeasts cannot be used much more widely in bread-making, so that loaves with no synthetic additives and longer production times can be available to all. John Downes pioneered the Australian sourdough revolution in the seventies, and is now working daily with yeasts, recreating the indigenous loaf of the British Isles: ale-barm bread.